All 13 excerpts are available in a single eBook “The Excerpts” on Amazon.com for $3.99 USD. 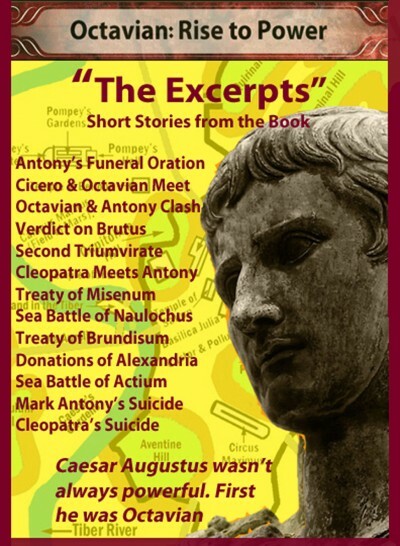 Octavian Chronicle #8, Treaty of Misenum-39, tells the whole story. 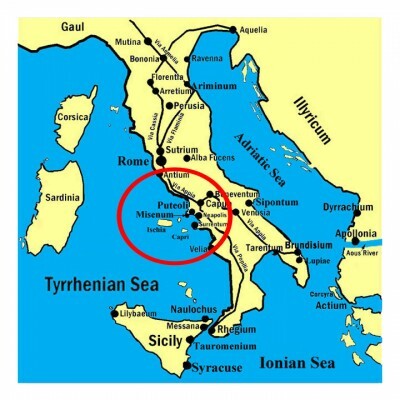 In the spring of 39 BC, Octavian and Mark Antony, accompanied by Maecenas, Asinius, and Plancus, met with Sextus Pompey and his advisors near the port city of Misenum on the north shore of the Bay of Naples. Sextus had taken control of Sicily and was using his powerful navy to block the grain ships from the east from sailing to Rome. He was starving Italy. Octavian wanted to reach an agreement with Sextus solely to buy time to build up his navy in preparation for a war against him. At noon, the next day, Antony and Octavian were standing on the shoreline platform with Asinius, Plancus, and Maecenas. They were looking out at Sextus’ huge ship docked next to his shipside platform. Sextus shouted, “Then we’re done talking!” He turned around and walked back toward his ship. Octavian nodded. He had that familiar gleam in his eye.